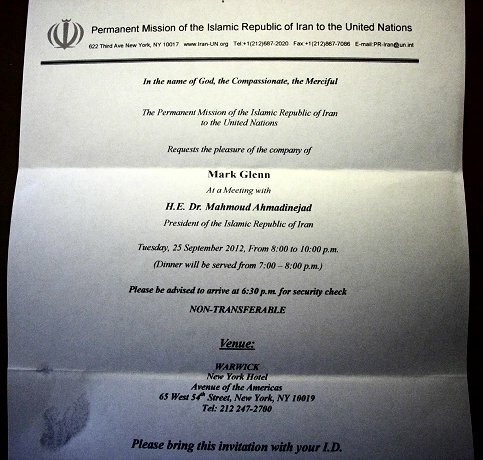 Above is the invitation Mark Glenn received for the event. 1st hour ~ The one and only ‘Antiochus’ with a stunning discussion/analysis of the news. 2nd hour~ A discussion of my recent trip to New York City, where I met Iran’s president Dr. Mahmoud Ahmadinejhad and gave a speech at the banquet set up in his honor. I wish I knew how to put these podcasts here into Snippits but, pc doofus that I am, I cannot figure it out. Anyhow, PLEASE listen to this broadcast by Mark Glenn in the second hour. Let me also plug the Ugly Truth Podcasts at this time. The speakers and talkers here are extraordinaire. Mark Glenn, Mark Dankoff, Max French, Jonathan Azaziah, Keith Johnson, Sammi Abrahem and others. We have frequent visits by awesome and well known guests such as Ken O'Keefe. The shows are daily although the schedule seems to fluctuate at times since all have busy lives and the guests are frequently from the opposite ends of the globe so time constraints come into play. There is a lively chat room anyone can access as well. I make a point of trying to be in the room whenever possible because it is actually quite fun and a lot of information is shared at times... not to mention a bit of camaraderie. In hour two here, Mountain Man Mark Glenn speaks of his trip to NYC and then his meeting with Dr. Ahmadinejad. His descriptions of the man differ greatly from the mainstream scrum, which is only to be expected as the man is painted always as a belligerent and bellicose entity brimming with anti semitic hatred, not the softly spoken cultured and humble, very brave man that he really is. Mark also witnessed the attack on the Iranian Minister in the streets of NYC in which he was struck and spit upon by attackers. What is NOT mentioned or shown in any coverage of this event is that the flags of the MEK, the recently delisted from the American terrorist list, were waving about as the attack took place. The communist fist raised flags of this Iranian, CIA/Mossad funded terrorist organization is nowhere in sight but they were there. Go here to hear this excellent podcast. I guarantee you will hear things from Mark Glenn that you have NEVER heard before. No pc doofus you! Our digital heroin! Thank you so for your kind words.